Scroll to the bottom of the page for the link to access the Google My Maps for my Yangon recommendation. Shwedagon Pagoda is the oldest Pagoda in the world, and the biggest pagoda in Yangon. It is known to house 8 strands of hair from Siddhartha Gautama (Buddha). Beautiful both in the day and night, it is recommended to visit the Pagoda at sunset to enjoy both day and night views of the temple grounds. As you encircle the central stupa, you will find the 8 main shrines at the foot of the stupa classified according to the day of the week, with Wednesday being split into Wednesday (Morning) and Wednesday (Afternoon). Myanmar astrology is based on the day of the week; you pray at the shrine corresponding to your astrology. You will find a lot of locals congregated at the 'Holy Ground' which is a specific area next to the main Pagoda which they consider the most 'potent'. Many couples also visit the fertility shrine, a specific shrine characterised by a statue of a mother holding a baby, to pray for a child. You can spend at least a day just wondering around downtown area. There's so much buzz in every nook and cranny of the city just waiting to be explored. The main areas of interest include Chinatown, Strand area and Cityhall. Yangon's vibrant and energetic Chinatown is home to Yangon's largest Chinese community. Stop by the famous Guan Yin temple, peruse local jewellers and goldsmiths, or go shopping along long stretches of stall-lined streets at the day-time Chinatown market . You can literally buy anything here, from fresh flowers to pets, local clothing, electronics and livestock. Around the cityhall area, you will also find the Yangon War Memorial Park, Sule Pagoda (situated in the middle of a roundabout), Churches, Mosques, and even more roadside stalls and shops. The Strand area has a few British colonial era structures, the most famous one being the Strand Hotel. The General Post Office provides a nice backdrop for photos. The Botahtuang Jetty shows a glimpse of local life, where locals cross over Yangon River to get to the other townships. Bogyoke Market is one of the main tourist attractions in downtown. You can find goods like pearls, jewellery, paintings, cane baskets, traditional Burmese clothin and bags. The market is also a popular place to purchase Myanmar traditional wear (Longyi skirt + Blouse for the ladies). A typical clothing set shouldn't cost more than 15,000 kyatts (15 USD). As the market is very 'touristy', be wary of exploitative salesmen. Always try to haggle for a better price. Also known as the Allied War Memorial Cemetery, the Taukkyan War Cemetry commemorates over 30,000 British Commonwealth soldiers who died in Burma during World War II. This is a very peaceful cemetery with beautiful archways and neat, manicured lawns. It is located in Greater Yangon, about an hour's taxi ride from Downtown Yangon. The Yangon Circular Train connects Yangon City to the suburban areas and satellite towns. This train system transports thousands of lower-income commuters to and fro Yangon City everyday. The circular train goes in a loop, the entire journey taking 3 hours to complete. This is a great experience to witness short snippets of local life and see local villages. All trains depart from Yangon Central Railway Station. Tickets only cost 1,000 Kyatts (1 USD)! You can buy a ticket at the train station ticketing booth. While there are both A/C and non-A/C trains serving the tracks, I would recommend the non-A/C train for a more authentic experience. Tourists are advised to stay on the train to complete the entire loop, but my dad and I decided to hop off at Danyingone Station because we got a bit bored and wanted to participate in the local market activity! Trains don't come to a complete stop, so be careful when you hop off. Most importantly, do not miss the last return train. Obtain a train schedule from the station master before your journey. This was definitely the highlight of my Yangon trip. My dad and I spent an entire afternoon exploring the market and hanging out with the friendly locals. It was refreshing being surrounded by the most humble and modest locals who were not tainted by materialism or superficial things. It was also interesting observing the interactions between the people in a community where barter trade is still predominant! Chauk Htat Gyi is a small-sized temple housing a 65-metre long reclining Buddha. The main attraction is the Buddha's foot with 108 squares representing the 108 different realms of existence. This is a local museum explaining the brief history of Myanmar through artefacts from the very first Myanmar civilisations. There aren't a lot of descriptions and explanations for each artefact or display - mostly just labels in English and Burmese. I actually really liked this museum despite its lack of decoration or explanations - there were some intricate and delicate artefacts that really caught my eye. My favourite exhibits are: Lion's Throne, The Crayfish Teapot, Pyinsa Rupa Harp. Pyinsa Rupa is a well-known Burmese mystical creature made of 5 different animal parts- elephant, bullock, horse, carp, and dragon. Inya Lake is Yangon's largest lake. It is a popular recreational area for locals and romantic hangout for couples. You can catch the sunset and sunrise at various points along the lake. Aung San Suu Kyi's red-roofed house is also located along the lake; it is visible from certain points across the lake. There are a few exercise groups for older men and women that get together everyday at 5am to work out by the lake to cheesy retro music. I had the opportunity to join in the exercise one morning after a night-out which was really fun. The Yangon University Boat Club has a simple alfresco dining area (do not expect anything too fancy), with great views of Inya Lake. My colleagues and local friends swear by the "to die for" pork-sticks hot pot at the Boat Club restaurant (see my food recommendations). Shwe Pu Zun is a very popular local bakery selling traditional pastries and cakes. My Burmese friends shared with me that rural Burmese people view this bakery as a 'food haven' since most of them do not have ovens to bake in their homes. That's why most locals from neighbouring villages and small towns like to make Shwe Pu Zun their first stop on a visit to Yangon. 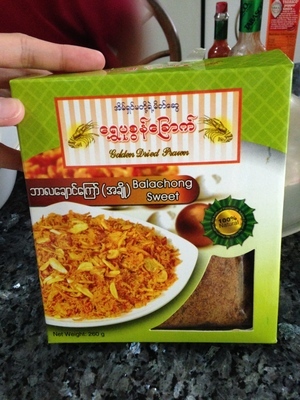 Shwe Kyi, a famous traditional Semolina pudding cake. Bar Lar Chaung: fried garlic and shrimp in oil; used as a garnish in soups and rice dishes which adds a fragrant and tasty punch to any boring meal! The more prominent family shopping malls are Junction Square and Taw Win Centre. These malls mostly stock local brands with few international retailers. The range of clothing and designs are definitely not as extensive or as great as other Southeast Asian shopping hubs like Bangkok/ KL/ Singapore. While materialist culture is still slow and underdeveloped in Myanmar (good thing), a visit to these malls is a good opportunity to observe what local modern family life in Myanmar is about. That's all for my Things to Do in Yangon recommendations - I hope you like them! Access my Google My Map for Yangon, which also includes food, club and bar recommendations.